This is the house we made out of a box for Nanook, my Lego Eskimo minifigure. 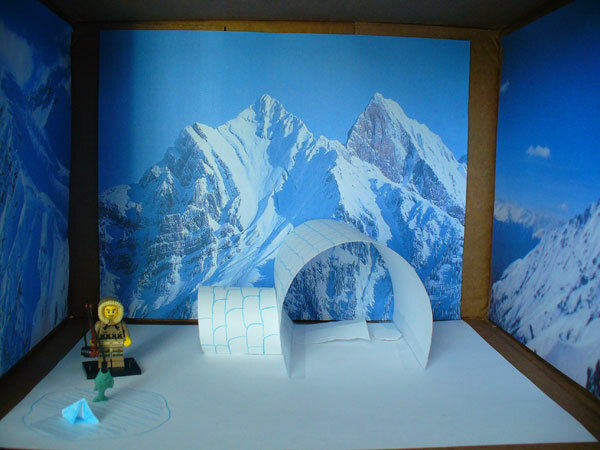 We made snowy mountains, an igloo, and a place for him to go ice fishing. Eskimos are people who lived in the very cold weather. Eskimos had to build their houses out of snow. Eskimos houses are called igloos. Because the weather was so cold they had to make their houses out of snow bricks and put the snow bricks in the shape of a dome with a littler dome in front of the big dome for a door! Eskimos had to go ice fishing to get food to eat because everything was solid ice (on the ground and everywhere). The temperature when the Eskimos were around was below 50 degrees (that’s very cold weather they had)! I have learned that Eskimos are still around today (but the only thing is that they probably don’t live in igloos). I have a Lego Mini figure that is an Eskimo. 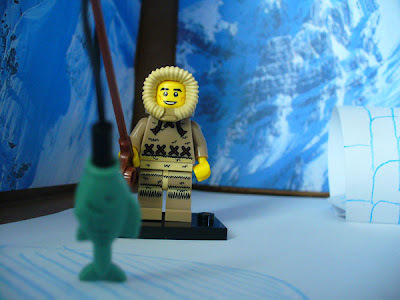 My Lego Eskimo is what made me want to learn a whole ton of really cool facts about Eskimos, so I could learn about how they made their houses, the way they got food, how they kept very warm in the very cold weather (when they lived in igloos). There are many others reasons why I wanted to learn about Eskimos. I think Eskimos are awesome! This is how Nanook looks up close. He is fishing! October 4, 2011 October 13, 2014 SarahComments are off for this post. I enjoyed reading your facts about eskimos. You did a great job on building the igloo for your lego eskimo. I used to watch a show called Northern Exposure. I have also seen the movie Snow Dogs. Both are set in Alaska, and although they aren’t eskimos, I learned a lot about living in the very cold weather!